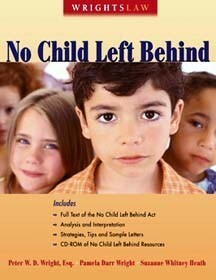 Harbor House Law Press advises that Wrightslaw: No Child Left Behind is at the printer. Bluelines have been approved. Harbor House will receive shipment of the book in the first week of December. People who order Wrightslaw: No Child Left Behind with the Wrightslaw NCLB CD-ROM between November 4 and November 18 will receive a free Wrightslaw Special Education Law CD-ROM (value: $14.95) and free shipping on all Wrightslaw books. Wrightslaw: No Child Left Behind will help you find answers to your questionsin the No Child Left Behind statute, regulations, and publications from the U. S. Department of Education. What does the law say about reading? What are the essential components of a reading program? What is scientifically based reading research? What does the law say about annual proficiency tests? Who must be tested? In what subjects? Whose scores must be reported? What does the law say about accommodations? Who is exempt from annual proficiency tests? Are the tests to determine grade retention and promotion? What does the law say about accountability, school and school district report cards, schools in need of improvement? What does the law say about sanctions, public school choice, supplemental educational services and tutoring? What are the requirements for highly qualified teachers? Do these requirements affect special education teachers? What are the educational requirements for paraprofessionals? How does the law limit the duties paraprofessionals may perform? What does the law say about the parent's right to know the qualifications of their child's teachers? The parent's right to observe their child's classroom? Parent access to instructional material? Wrightslaw: No Child Left Behind is supplemented by the Wrightslaw No Child Left Behind CD-ROM that includes the full text of Titles I through X of the No Child Left Behind Act with commentary, cross-references, and resources, the No Child Left Behind regulations published by the U. S. Department of Education, and the No Child Left Behind Act (Public Law 107-110). The Wrightslaw No Child Left Behind CD-ROM also includes the No Child Left Behind Deskbook, No Child Left Behind: A Parent's Guide, A Toolkit for Teachers, and dozens of Guidance publications and Fact Sheets on key topics from the U. S. Department of Education. Parents - You need to know your rights and responsibilities under the No Child Left Behind Act and how this law affects your child's education. Teachers and school administrators - No Child Left Behind will have a profound impact on you and your job. You need to learn about mentoring, bonus pay, scholarships and fellowships for advanced certification, and the new teacher liability protections. Educators in the private sector -You may decide to provide services as a supplemental educational service provider or apply for grants available for innovative programs. Attorneys and lay advocates - You need to have quick access to the statutes, regulations, and guidance publications. In Wrightslaw: No Child Left Behind, your primary legal references are in one place. To learn more about Wrightslaw: No Child Left Behind, download the Table of Contents, Introduction, and index, please visit the Wrightslaw: No Child Left Behind info page. You can also use our toll-free fax number to order. Just download the order form, fill in the fields, and fax your order to 800-863-5348. You may also order by mail. Download and print the order form. Send your order and your check or credit card information to Harbor House Law Press, P. O. Box 480, Hartfield, VA 23071. Wrightslaw: No Child Left Behind is only available from Wrightslaw and Harbor House Law Press. The book will not be available from bookstores for several months. To ensure that you get a copy of Wrightslaw: No Child Left Behind, order now! Harbor House will process orders on a first come, first served basis. The Advocacy Challenge Discount Program is a 50% discount for individuals and groups who purchase boxes of books. If you are a special ed organization, parent group, teach an advocacy class, or engage in a similar venture, you may be eligible for the Advocacy Challenge Discount. You did a Herculean job of analyzing the No Child Left Behind Act . . . that will pay dividends for parents and advocates.  Torin Togut, Esq. Please share this offer with others who are interested in education and advocacy.